Fresh on the heels of a fantastic Super Bowl, and just a few wake-up calls short of the biggest NASCAR race of the season – the Daytona 500 – I wonder what would be considered the “majors” for hunters. My hunting buddy, Jason Shell, and I pondered the topic last weekend. And for the most part, he and I are in accordance with what we consider the “majors” in our hunting minds. There is no question that majors of hunting are quite a bit different from the top events in sports like golf. With hunting, it surely is a more individual thing. Hunting elk with a bow is among this blogger's "majors" in hunting! I think most hunters in our country would consider hunting the majestic whitetail in the midwest as one of their majors. After several trips to the corn belt, and seeing some of the deer that roam those parts, I would easily agree, and I consider chasing deer there one of my favorite pastimes. Having the opportunity to hunt elk with a bow is one of the majors I hope to accomplish someday. It’s a dream I’ve had for a number of years. 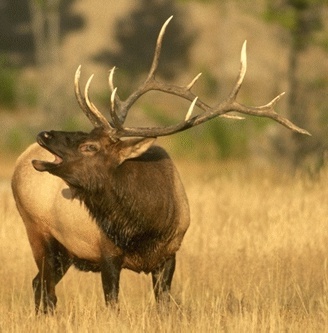 Whether it’s a do-it-yourself expedition or with an outfitter, having the chance to get within bow range on a bugling 1,000-pound elk is on my bucket list! Could you imagine? I’m envious of all my friends who have had the opportunity to do that! Also on my to-do list is hunting mule deer, chasing a 30″ monster in the western part of this fine Union. Consider this a slight hint to a certain friend who grew up in North Logan, Utah, to think about hooking his favorite blogger up with the right folks to make that happen! At some point in my hunting career, I’m going to schedule my spring around completing the Grand Slam in turkey hunting. Fueled partially by the end of deer and duck season and the turkey season being next on my hunting agenda, I get ridiculously excited about considering the challenge of completing the royal flush of hunting thunder chickens – successfully killing all four major subspecies of turkeys (Eastern, Merriam’s, Osceola and Rio Grande). I know of several friends who have accomplished this feat and, once again, I’m envious. This is one where family and work might make it hard to achieve until retirement, but mark my words that it will happen at some point! I can’t wait. Much like golfers who lift above all else the possibility of holding all “majors” in one season, I can’t help but think that completing all the “majors” above in the same year would be the greatest of all hunting achievements. Of course, it would come with a helluva taxidermy bill! Tales: Just a heads up that the Daytona 500 will air live on Fox, Feb. 20. Green flag is slated for 1 p.m. EST.